These are a selection of hotels which are based in ideal locations for keen cyclists, usually in a rural setting close to popular cycling routes. In this category of hotels, you can find establishments which are accustomed to accommodating cyclists, providing nutritious meals, as well as useful places to stay near popular cycle routes; such as for the cycle racing event 'Vuelta Ciclista a Andalucia', which takes place in the region every February. In addition to accessibility to various routes, these cycling hotels provide secure lock-up or garage facilities for bicycles and other equipment. Hotel Fuerte Grazalema is set within the beautiful Sierra de Grazalema Nature Reserve, 20 km from Ronda. Protected by UNESCO, the Grazalema Mountains are ideal for hiking, cycling or bird watching. Jerez Airport is 88 km away. Malaga Airport is 129 km away and the station at Ave de Santa Ana in Antequera is 94 km away. urrounded by olive groves and herb gardens, Casa La Siesta features an infinity swimming pool and beautiful accommodation with balconies and views. 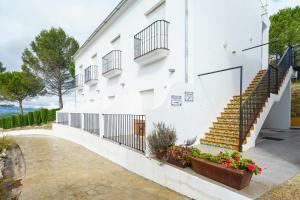 It offers a peaceful setting in Los Parralejos, 10 km from Vejer de la Frontera. The surrounding area is ideal for cycling and horse riding. First built in 1929, this hotel is within the Oromana Nature Reserve, 15 km from Seville. There is a seasonal outdoor swimming pool and an on-site restaurant. Free WiFi is provided throughout the property. Hotel Oromana is set surrounded by pine trees. The hotel is near the A-92 and A-376 Motorway. Hotel Estación Vía Verde in Olvera provides accommodation with a seasonal outdoor swimming pool and a terrace. This property also has a restaurant and a children's playground. The area is popular for cycling and hiking, and bike hire is available at this 2-star hotel. Las Errizas is a typical whitewashed building set 0.5 km from Alcalá del Valle, part of Andalucía’s White Town Route. It includes a free Wi-Fi zone, tennis courts and a swimming pool. Staff at reception can organise personalised hiking, cycling and horse-riding routes. Set in Caleta De Velez, Cortijo Nidolea features free bikes, BBQ facilities and garden. Featuring a shared kitchen, this property also provides guests with a terrace. Both free WiFi and private parking are accessible on site. All rooms in the guest house are fitted with a kettle. A continental breakfast is served every morning at the property. Set in El Gastor, Conjunto El Carramolo provides accommodation with free WiFi, seating area and flat-screen TV. All units are fitted with a microwave, toaster, a coffee machine, a fridge and kettle. Guests at Conjunto El Carramolo can enjoy cycling and fishing nearby, or make the most of the sun terrace. Located in the hills outside Zahara de la Sierra, this hotel offers amazing views of the Lijar Mountains from its infinity pool. Its air-conditioned rooms have a flat-screen TV. The hotel can organise activities such as horse riding, quad biking and canoeing. Staff can provide information about what to see and do in Andalucía. Located in Cazorla, next to the nature reserve of Cazorla, Segura and Las Villas, Hotel Villa de Cazorla offers accommodation with a seasonal outdoor pool. Free WiFi is provided in common areas. Every room features a private entrance and a private bathroom with a bath. The individually decorated caves, apartments and studios at Tío Tobas have a fireplace, kitchen facilities and a bathroom. Some of them also have wonderful views of the surrounding countryside. Staff can provide information on activities available in the surrounding area. Hotel Maria is located in Posadas, 2 minutes’ drive from Posadas Train Station and 26 km from Córdoba. Hotel Maria has a 24-hour reception where staff can provide tourist information about the area. Hiking, cycling and horse riding can be practised nearby. Hotel Nerja Club is situated in a quiet area of Nerja, 12 minutes' walk from the town centre. It offers an outdoor pool and a sun terrace. There is also a spa area featuring a pool with jets and a hot tub. The air-conditioned rooms at the Hotel Nerja Club feature modern décor. Located in San José, only a 10-minute drive from the beautiful beaches on Cabo de Gata, this rural property features 2 shared outdoor pools, a large garden area and a café-bar. Hotel Villa Maltés offers air-conditioned rooms and apartments. San José, is just 5 km from Hotel Villa Maltés. Here you will find numerous shops, bars and restaurants. Set in attractive gardens, the Ayre Hotel Córdoba is a 10-minute drive from central Córdoba. This stylish hotel offers a seasonal outdoor pool, 2 restaurants and free WiFi. This hotel has been certified as bicycle-friendly and it offers a repair centre, information on trails, and storage. Offering a beautiful mountain setting, Cortijo Puente Faco features a terrace and a garden overlooking Los Calares Nature Reserve. Staff can arrange activities including horse riding 4x4 driving, hunting, cycling and hiking. Set in a converted former station, on the Via Verde de la Sierra hiking route, Hotel Puerta de la Sierra features free WiFi and a terrace. There is an on-site restaurant and bar, and every room at this hotel is air conditioned. Guests can enjoy various activities in the surroundings, including cycling and hiking.